“Nah, I’m sure if it’s my kind of thing,” said my friend recently on MSN. “Nah, trust me, mate,” I replied. “You’ll love it. And you’re an accountant, so this is great to de-stress.” In a nutshell, then, ‘Kung Fu Panda’ will serve up as fair an amount of laughter as the noodles also available in the film. I admitted to not having high hopes for the film, given the track record of Dreamworks Animation. Yeah, they made some fun movies (like the ‘Shrek’ movies), but in terms of animation, it’s not exactly on the same level as Pixar. It’s probably not fair to compare the two of them together too much, though, so I’ll keep those comparisons down to the barest of minimums. I will, however, say this: while Pixar depends on their storytelling strength to carry its movies through, Dreamworks seems to have gone almost completely in the other direction, relying on the star power of the cast members who provide the voice for the animated characters. While you’d be hardpressed to pick a recognisable star from, say, ‘Ratatouille’, ‘Kung Fu Panda’ has the talents of Jack Black, Angelina Jolie, Dustin Hoffman, Lucy Liu, and even Jackie Chan, amongst others, to fall back on. I say almost completely, because the story is still…well, fun. 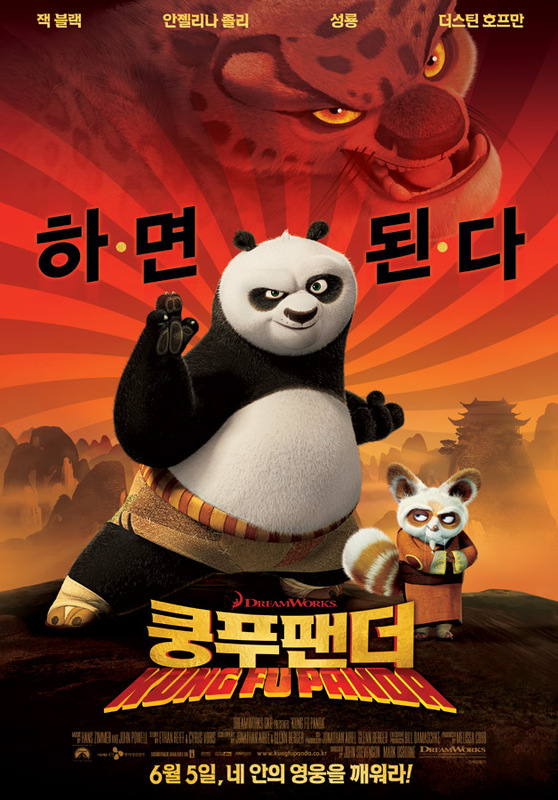 The film follows Po (Black), arguably the laziest of the pandas around. He may also well be the biggest of kung-fu fans around. 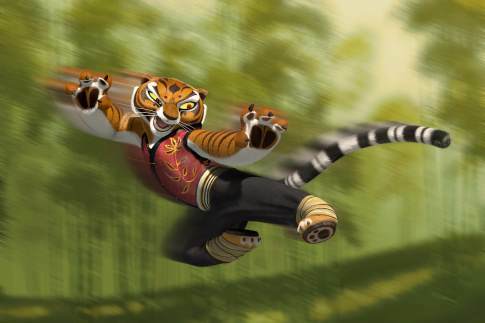 He dreams of joining his heroes of the Furious Five, a group of warriors trained by Master Shifu (Hoffman). However, he is stuck in the little place we all know as reality. He has to help his father run the noodle shop, which is his father’s own dream. 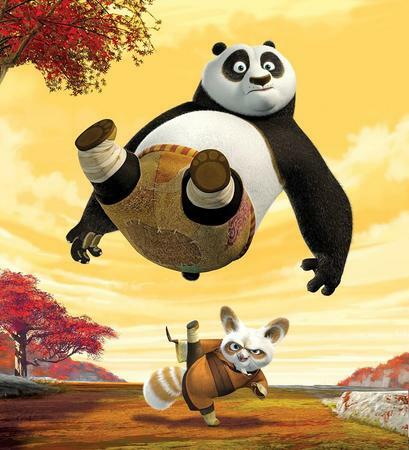 Of course, the day comes for when Master Shifu decides to pick the Dragon Warrior, a fighter who will be handed the Dragon Scroll, which contains the secret to becoming the greatest fighter in the world. This is necessitated by the escape of Tai Lung (Ian McShane), who is harbouring his own dreams of owning the dragon scroll. 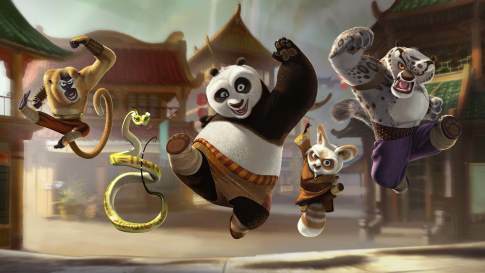 Inevitably, and by way of a crazy set of events, Po the Panda is selected as the Dragon Warrior, something that Master Shifu and his Furious Five (especially Tigress, voiced by Jolie) is not happy about. Despite the amount of protest, their grand master, Oogway (Randall Duk Kim, better known as the key maket from ‘The Matrix Reloaded’) refused to back down on his decision, believing that everything is the way it is meant to be. Thus, Po being the Dragon Warrior is already written in the stars, and it is a choice that Master Shifu and his students had to follow. It is this part that struck me the most about Kung Fu Panda. OK, so it is an American production, but it pays a relatively close amount of attention to certain aspects of Chinese culture. I can’t recall too many films (animated or otherwise) that aims for such details. For example, grand master Oogway has a tendency to speak in the style of the Old Chinese sayings, using metaphors, analogies, and more to explain his choices, as well as his prophecies, to Master Shifu. “There are no accidents” is a common utterance that he often says. “Yesterday is history, tomorrow is a mystery, but today is a gift. That is why it is called the present” represents the cornier of the brethren, but the inclusion of such lines shows that, while the filmmakers are willing to poke a bit of fun at this particular Chinese tradition, they also know exactly what it is that they’re poking fun of. The audience knows as well, and as such, it makes for an enjoyable occasion. Names like the Pool of Sacred Tears, the Legendary Urn of Whispering Warriors, and the Wuxi finger hold (“The Wuxi finger hold!”) also continues this thread. Don’t, however, let all of that fool you. This is first and foremost a Jack Black film. And now, an image should form in your mind of what a Jack Black film is. Plenty of word play, plenty of self-depreciating humour…and plenty of fun. “Legend tells of a legendary warrior whose kung fu skills were the stuff of legend” is the first line of the film, and straight from the bat, the comedic tone is established. The opening sequences were pretty funny, too, and given that they were hand-drawn, not something you’d see a lot of these days. Animation-wise, I wouldn’t be the first to know whether it matches up to the fares put out by other studios. I still tend to place more emphasis on the story, rather than the fine aspects of the colours or the computer rendering. To my eyes, they seem to be on par with anything else on offer today. And that’s the part that surprised me the most: the story. While the story of the reluctant hero has been told time and again, this movie kinda messed up all my expectations with regards to a lot of things. 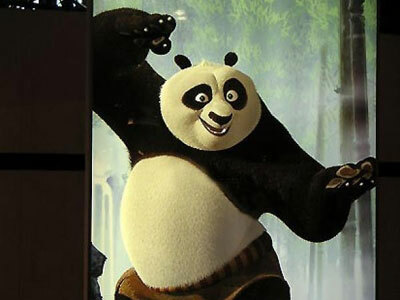 First of all, ‘Kung Fu’ is different from all the other Dreamworks animations. It has a good story to tell, and it is a story well told. Entertainingly told, too, to boot, but more importantly, it’s essentially one big circle that finally comes round to connect the dots. Almost Disney-like, one could say, but then again, that would be asserting that only Disney could make good cartoons (they make some terrible ones, too, mind you). From that regard, then, this film is an artistic (and financial) success for the company and its merry band of filmmakers. On a cultural level, its exposition of Chinese culture is also interesting. I thought that perhaps more attention would be given to having bigger digs at American pop culture (see ‘Madagascar’ and ‘Shark Tale’). Here, however, the focus is more on showing Chinese culture to the world. It is more political, in that sense. Hence, while I went in expecting a good time, but not a particularly great one, my level of expectation may have helped in that regard. I ended up having a great time, and laughed, perhaps on average, every 30 seconds or so. Even accountants will enjoy that, I think. Fikri didn’t realise that Jackie Chan is one of the actors until he saw the credits rolled up…and then he wondered who he voiced. jackie chan as the monkey probably had like a post-it note sized script.